Summertime sadness, that’s the common feeling when September rolls around. Back to school, chilli weather, and shorter days all come to mind, but not everything is unfavorable when fall sets in. Personally, I love shopping for fall clothes. The scenery is a beauty too! Ok, enough cheesy talk, I know you came here for one reason only: to download my newest Persian DJ mix. Going with the same theme as the earlier DJ Borhan Fall Mixes, it consists of ‘relatively’ new Persian songs with a mix of House and Spanish tunes. Be the first to know of my DJ mixes. Connect with me on Facebook, Twitter & Instagram. Canada's Bia2.com resident DJ, DJ Borhan specializes in wedding, corporate, international, and nightclub events. With over 12 years of DJing experience, which include worldwide appearances, you'll have peace of mind knowing he can rock any party! 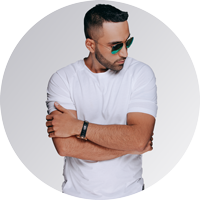 His unique DJing skills and passion for music has garnered him as one of Canada's highly sought after DJs in his niche.